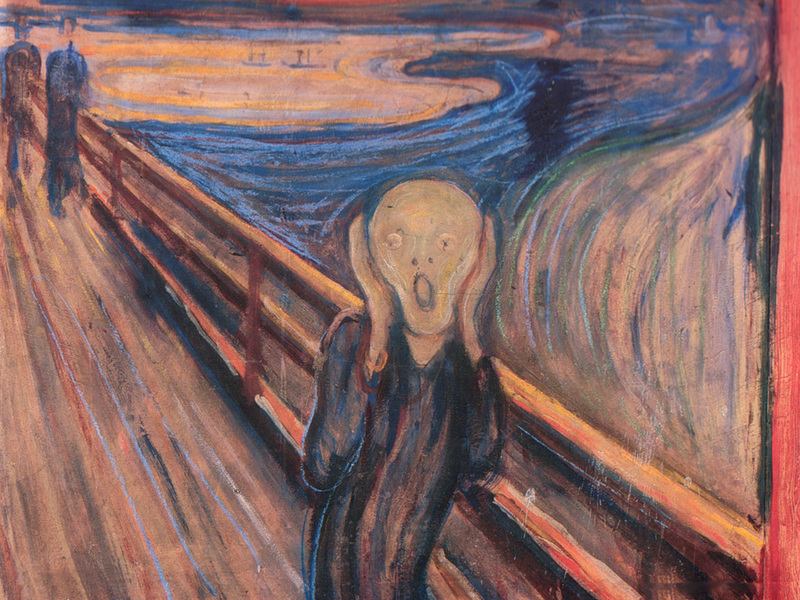 Arghhhhh: This is what I look like while playing horror games. Horror games have a funny effect on me. I know what I’m seeing isn’t real – that it’s just a collection of pixels on a screen – but I still can’t help but get a knot in my real stomach every time I cautiously put my on-screen character’s virtual feet one in front of the other, fearful of what is going to jump out at it me. I’m a scaredy cat when it comes to horror games. They say that horror games like Alien Isolation should be played at night, with the lights off, while wearing headphones. They say that it heightens the experience. Bugger that: I play horror games during the day. Why makes things worse for myself? 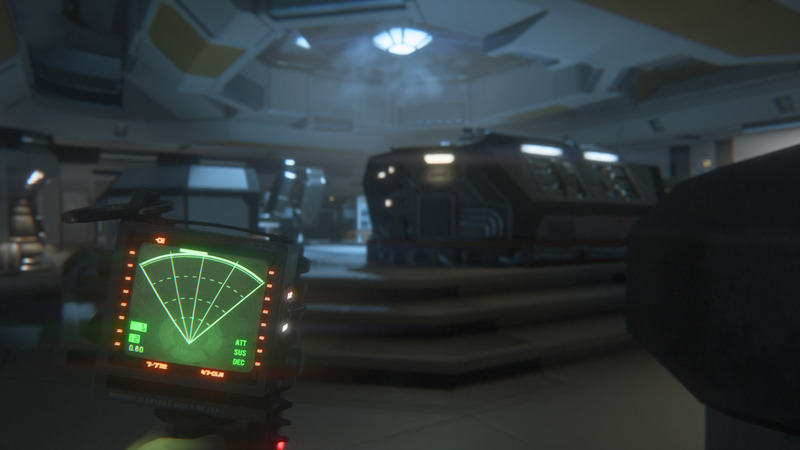 From the very beginning of Alien Isolation, developer Creative Assembly has captured the feel of the movie Alien. From the scratchy, grainy 20th Century Fox logo to the moody theme music in the front end to the environments, this game feels like it’s the Alien game we’d been hoping for. 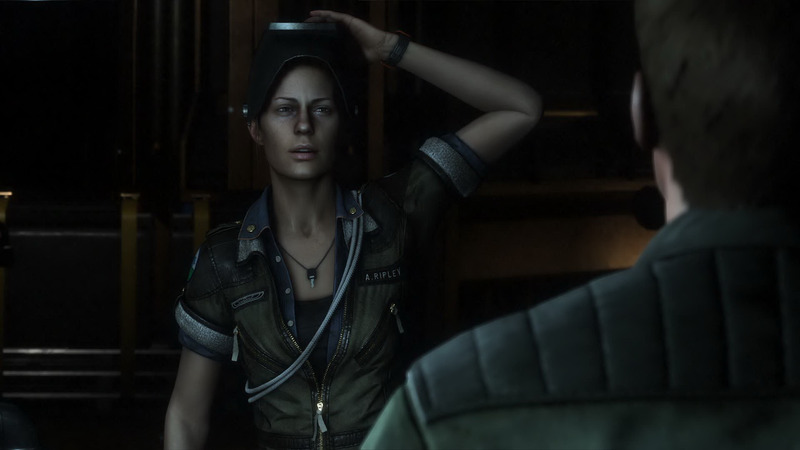 Heroine: Amanda Ripley is the daughter of Ellen Ripley, the main character in Ridley Scott’s Alien movie. Set 15 years after the original Alien movie, the game’s heroine is Amanda Ripley, the daughter of Alien’s Ellen Ripley, who is asked to be part of a team that will pick up the flight recorder from Ellen Ripley’s escape. The recorder is being held on Sevastopol Station, an off-world mining colony. Alien Isolation takes place in a world that pays homage to Ridley Scott’s movie, made in a time when analogue, switches and green-hued screens were common place and the world digital didn’t even exist. Computers take ages to warm up and boot, levers feels solid and weighted, doors take what seems like forever to open. Even the save stations fit with the time period, looking like an antiquated relic from a bygone era. Even wandering around the spaceship Torrens, the ship that takes Ripley and her colleagues to the ill-fated Sevastopol Station, is Nostromo-like in its presentation, right down to that tipping bird thing that dips its beak into a glass. For someone like me who still has a copy of the original movie on DVD somewhere, it’s a trip down memory lane. 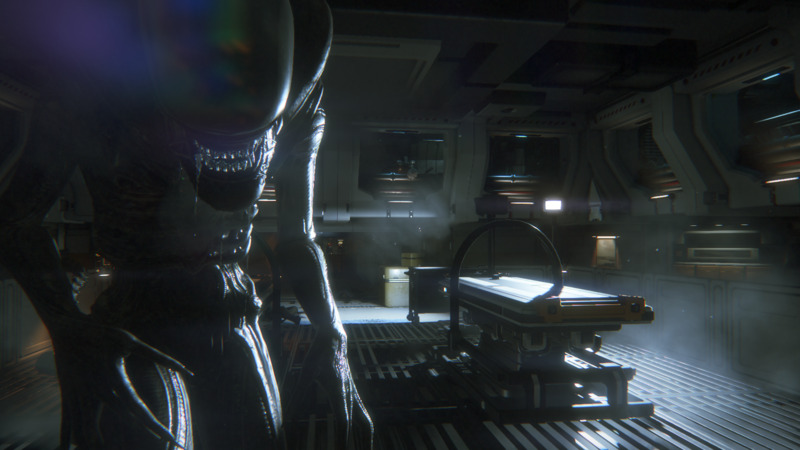 The first hour or so was surprising, with little scares or surprises but Alien Isolation builds the tension slowly before you actually see the alien: lights go out in corridors, swinging lights cast ominous shadows, creaks and moans from the Sevastopol hint at some unseen horror crawling about air ducts. The alien is also hinted at by survivors, one of them mentioning “something” is picking off the crew, one by one. For me, Alien Isolation succeeds because it hints at horrors, rather than having in your face blood and guts. My, what big teeth: The Alien closes in for the kill. But when I first encountered the alien I was a little underwhelmed, to be honest. It’d unfurled from an overhead vent, it’s serpentine tail whipping perilously close to Ripley’s leg (at this point she’s cowering under a desk, which is probably what I would do in similar circumstances.) The alien disappeared almost as soon as it had appeared, but it had planted the seed in my mind so from that point on, as I guided Ripley further into the confines of Sevastopol, I approached every door with caution and every junction with suspicion. The alien isn’t the only danger onboard Sevastopol, though, (the station’s android can be just as deadly, but at least you can kill them, eventually) but developer Creative Assembly (which is more well known for its Total War strategy series) has apparently given the xenomorph an unscripted AI, meaning the creature doesn’t react based on pre-scripted cues, such as you passing a specific invisible line in a room or at a certain point. That’s a great idea as it makes the alien unpredictable, which is what a monster should be, right, and the clunking I often heard in the ceiling had me more cautious the further I progressed. Blip, blip, blip: The motion tracker helps tell you where foes are but it can also tell the alien where you are. My teenage son, who’s also making his way through the game, experienced the unpredictability of the alien first hand when, just metres from the safety of an elevator and tracking the creatures movements meticulously with the motion tracker, the beast dropped from a ceiling vent and pounced. I haven’t finished the game yet – I’m still making my way through Sevastopol Station, pausing behind corners more than perhaps I should, fearful the alien will be right behind me when I turn around – but I’m liking what I’ve played so far, although I am starting to feel as if there is a little bit of padding in missions to make the experience last longer. Perhaps my biggest gripe is with Alien Isolation is with the save system, where you can manually save progress every time you come across a save station. Sometimes, though, you’ll get killed before the next save point, meaning you’ll sometimes have to (frustratingly) re-play from the most recent save to where you died. It would have been nice to have seen a checkpoint-style system in place. Alien Isolation has atmosphere by the bucket loads and it’s meaning that I’m more cautious about how quickly I move through the environment. And that’s a good thing. Besides, it hopefully won’t take me too long to finish, given that with Daylight Saving I’ve got more daylight hours to play it. Update Number 1: Ridiculously, I forgot to mention the music in Alien Isolation. In a word: It’s wonderful. The reason it’s so wonderful is because it’s atmospheric , just like the soundtrack of the original movie. The soundtrack really builds up the tension in all the right places and if you’ve seen the music, you’ll go all misty eyed over the haunting tones at the menu screen. Thanks to Sega, which provided a copy of Alien Isolation on PlayStation 4.